Though it was officially named the Daniel Carter Beard Bridge (after the co-founder of the Boy Scouts and the Sons of Daniel Boone), the public in Newport quickly began calling this the "Big Mac Bridge" shortly after its completion in 1976. The twin yellow arches of the structure recalled the double "golden arches" of the McDonald's logo in many people's minds. According to Wikipedia, "McDonald's considered opening a restaurant at the base after the nickname caught on, but never went to construction." 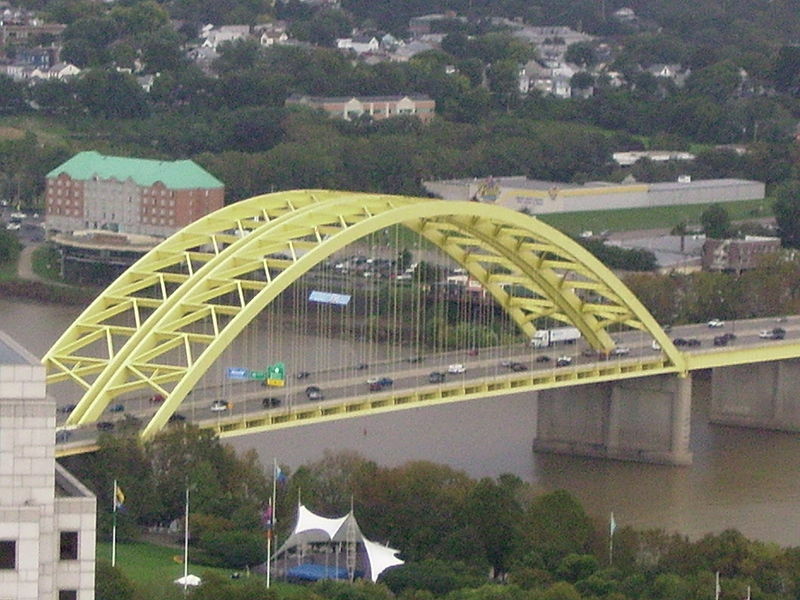 I'm not sure why the bridge was painted bright mustard yellow in the first place; perhaps the same "focus groups" were hired to determine its color as with the Purple People Bridge. I've always been fascinated with the little building that's perched atop the Fourteenth Street Railroad Bridge just outside of downtown Louisville. I had always thought the bridge abandoned, since I've never noticed any trains crossing it. But reading up on it online just now, I find it's open and doing well under the auspices of the Louisville & Indiana Railroad (whose logo can be clearly seen on the little building). 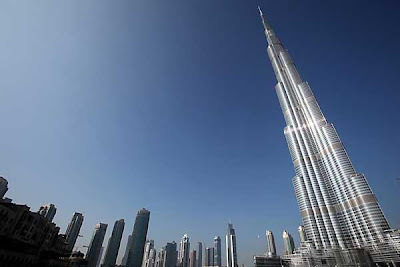 I'd like to venture up there sometime if they'll let me, and take some photos from that vantage point. The bridge runs along the beginning of the McAlpine Locks and Dam area. A hydroelectric plant is operated here by the always-controversial utility company LG&E, or should I say E.ON; no wait, I mean PPL. Before being rechristened after William McAlpine in 1960, this was known as the Louisville-Portland Canal since its completion in 1830, and to this day, many people still refer to this area as simply "the canal". The canal had a convoluted history, which involved costs going way over estimate - due in part to unforeseen difficulties with the solid rock bed near the Falls of the Ohio that needed to dug out completely by workers (including a young Abraham Lincoln, who was part of the construction crew in 1827). President Andrew Jackson refused to give a third injection of government funding to save the project, and it was barely finished with the help of private investors. But by 1855, the government had taken over the canal in a massive buyout. 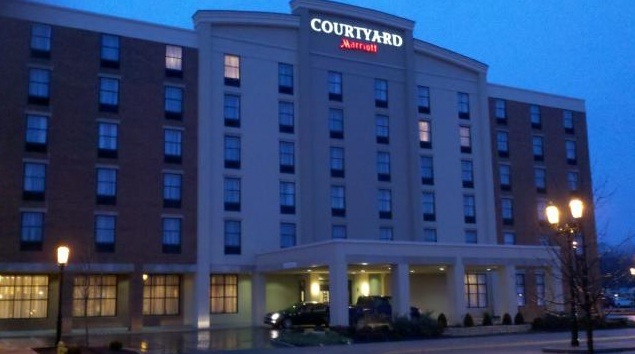 Charles R. Weaver, 46, from Hindman, Kentucky, was arrested at the downtown Cincinnati Courtyard by Marriott. A police report stated that water was coming out from under the door to Weaver's room and was leaking into rooms next door and into the lobby. According the report Weaver was found laying in the water naked and he was screaming that someone was trying to set him on fire. Weaver also allegedly set off a fire alarm while trying to run away from the police, according to the report. He also allegedly broke a window because according to him, he was trying to get his sister's attention outside. Police also report that they found 24 grams of cocaine wrapped in money, several bottles of alcohol and 1.8 ounces of marijuana in Weaver's room. Weaver apparently admitted that he had been doing drugs over the past couple days. According to WLEX 18, Weaver originally admitted to using the drugs, but then changed his story and accused the police of planting them in his hotel room. The damage done to Weaver's room, adjoining rooms, the hallway and the lobby will cost many thousands to repair. Hope this clown still has some money left after buying all those drugs, because he's going to need it. La Grange was named after Freemason Marquis de Lafayette, whose wanderings around Kentucky seem to have had quite an influence - one that may be continuing to reverberate to this very day via the so-called "Fayette Factor". So, this morning I found myself walking down an alley in downtown La Grange, when I unexpectedly encountered this wild little hair salon with some very unique architecture and idiosyncratic black-and-blue color scheme. Who can say it isn't beautiful? 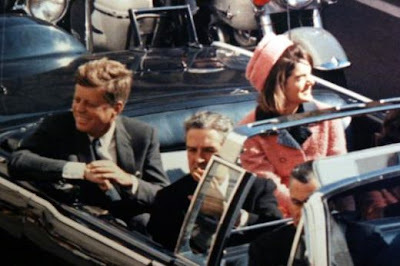 Today is the anniversary of the still-not-fully-explained assassination of John F. Kennedy. And yes, you need not be a conspiracy-theory type to consider it not fully explained - we do not know and can never know what really motivated Lee Harvey Oswald to do what he did, nor what motivated Jack Ruby in turn to do what he did. Guy Banister died in 1964, David Ferrie in 1967, and Clay Shaw in 1974, so with every major player in the story dead, there's really no chance we can ever really know just what the hell really happened in America on this day in 1963, or why. A couple years ago, I here examined allegations about David Ferrie and Jack Martin living in Louisville for a short time, supposedly on some sort of nefarious secret mission. Some say they were here as private investigators to expose a "phony priest" scam, while others maintain they they themselves were behind the scam all along. Knowing how these kinds of spooks work, it wouldn't surprise me if both stories were true - that Ferrie and Martin were double-dipping and getting funding to investigate a crime ring that they were actually members of. Not much new info has come to light, at least from my meager efforts, since that blog post. Joan Mellen, in her JFK-conspiracy book A Farewell to Justice, takes some pains to drag an ex-CIA "flim flam artist" from Louisville named Thomas Edward Beckham (aka Eggleston Zimmerman) into the matter, but ends up with the same problem as those who investigated Ferrie and Martin - when you're dealing with shady characters like these, it's almost a given that the things they tell you are a mix of truth and lies, and it's up to you to sort them out like a bucket of nightcrawlers. According to researcher Peter Levenda, Beckham was a Bishop in the Universal Life Church (you know, that bunch popular during the Vietnam War for conferring religious titles to anyone for a small donation) and was not only pals with Ferrie, Oswald and Banister, but with Fred Lee Crisman. Crisman is a bizarre figure who, like Kentuckian Alfred M. Hubbard, seemed to have a knack for being connected to more than his share of spooky goings-on. Crisman's name turns up in connection with The Shaver Mystery, the Maury Island UFO Incident, the "NASA, Nazis & JFK" Torbitt Document, and the totally mind-melting mess that was Inslaw, PROMIS, Kentuckian Charles Hayes, and the death of Danny Casolaro. From 1964 to his death, he was a bishop of the newly-formed American Orthodox Catholic Church, having been consecrated by Bishop Earl Anglin James of Canada among others...Ferrie had been introduced to Stanley by Jack Martin, an investigator with Guy Banister’s detective agency in New Orleans. Martin has been portrayed as a hopeless drunk in Oliver Stone’s film of the assassination, and has been given short-shrift in other studies of the New Orleans connection. Martin himself ratted out Banister, Stanley and Ferrie to the FBI after the assassination when it became clear that District Attorney Jim Garrison was investigating the case. We should not take this all at face value, however, for Martin – even though he pretended to be investigating Carl Stanley – remained a bishop of the American Orthodox Catholic Church for many years after the assassination and until the day he died, even participating in the consecration of Thomas Jude Baumler – a self-admitted fascist and attorney who also worked briefly as an investigator for Guy Banister and as a New Orleans politician in his own right – as late as 1974. Carl Stanley died in Louisville of an apparent heart attack on March 8, 1967 - just a few days after Garrison arrested Clay Shaw and made a noisy spectacle about how he was about to crack the JFK case wide open. Does your head hurt yet? Mine sure does. Such is the way of the endless hedge maze that is the JFK conspiracy. Better minds than ours have burned out their brains and devoted their entire lifetime to the matter, convinced that it's a solvable problem and that it must be solved. I say, just enjoy the ride - and it is just a ride. No one understood this more than John Kennedy himself, from the way he lived to, literally, the way he died. 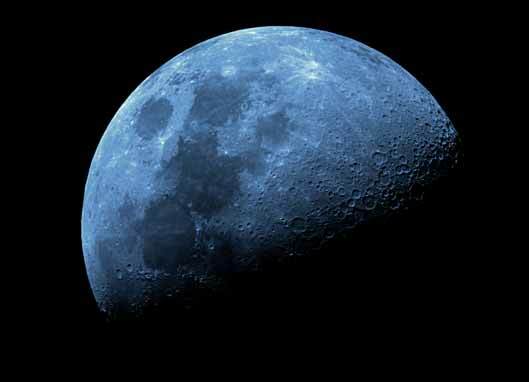 Last night was said to be, according to those who say such things, a "blue moon". Whatever that means. There are at least four different competing memes for just what constitutes this "blue moon" they speak of, and none of them are particularly satisfying to me. Apparently much of the misconceptions about it go back to a 1946 article in Sky & Telescope that was utterly, completely wrong - which just goes to show you can't always trust the "experts". I've already mused on this blog about the various weirdnesses involving blue moons, blue people, aliens, and Elvis, but this latest spate of media attention to the "blue moon" concept has my coffee-oiled gears turning again regarding Kentucky's peculiar obsession with blueness. 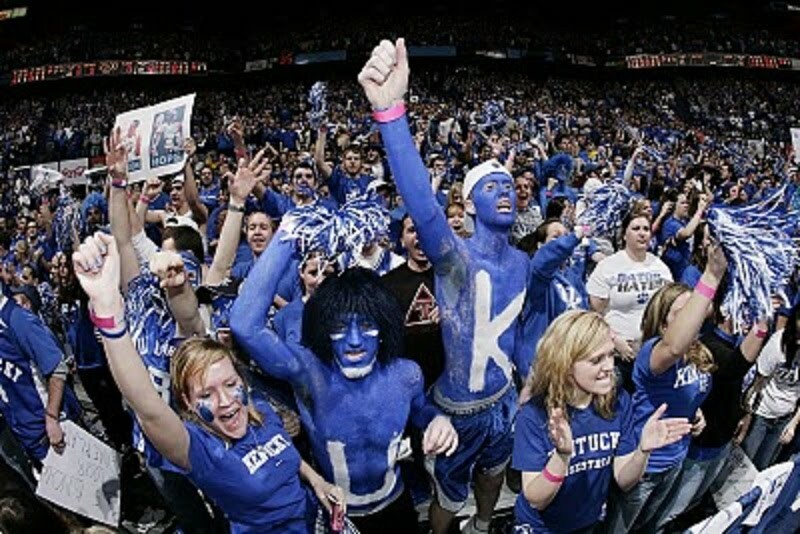 Of course, what comes to mind first are those ubiquitous Kentucky Wildcats of the University of Kentucky, with their slogans like "Go Big Blue!" and "I Bleed Blue". And much of our state's blue fetish is actually about misplaced blueness - blue moons aren't really blue, and neither is bluegrass. Blue people seem to be on the rise, culturally, what with Blue Man Group and Avatar. 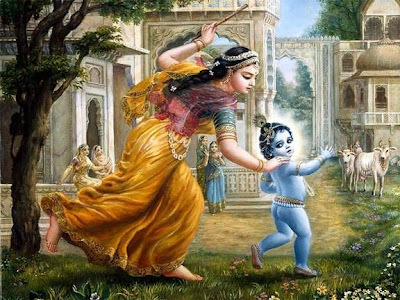 But for over a billion people on Earth, it's nothing new: Krishna has been predominantly portrayed as blue-skinned in the Hindu religion. But it's the idea of blue light that interests me most, as far as our discussions about Kentucky go. Reported nocturnal sightings of eerie blue lights - sometimes called "ghost lights" - in the Kentucky mountains have been shrugged off mostly as "swamp gas" (what would skeptics do without this crutch?) but on the other hand, it is possible that in earlier times, the many burning springs and natural gas vents dotting our state's landscape burned with a blue flame. Kentucky's curiously-named "Moonshine" also burns with a blue flame. Many of the UFOs seen around here are blue in color, such as in this report of blue lights in the sky above Fort Campbell (although the testimony doesn't make a whole lot of sense). Coincidentally, Fort Campbell was once home to an elite corps of secret Special Forces known as Blue Light. Then there's two different "Lady in Blue" haunting legends - one is said to haunt the Seelbach Hotel in Louisville, and a similar one dwells in the Keen Johnson Ballroom at Eastern Kentucky University (Consult your copy of Weird Kentucky for more info on both). And maybe the "Gray Lady" of Liberty Hall is actually a very pale blue. Perhaps blue just happens to be the basic color of mystical energy, or "life force", or whatever you want to call it if you believe in that sort of thing. 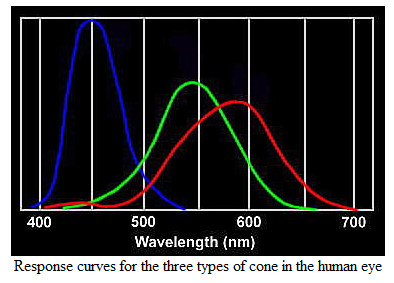 Interestingly, although blue has an extremely short wavelength, the receptors in the human eye are specially geared to detect blue to a greater degree. Kentuckian Tom Cruise was recently spotted filming a scene for his upcoming Mission Impossible IV, perched atop the tallest building in the world - Dubai's Burj Khalifa. The Burj Khalifa was also examined on this blog here last year, when Dubai's ruler, Sheikh Mohammed bin Rashid Al Maktoum, came to Lexington. Cruise's latest daring film shoot - which gives me vertigo just to think about it - came during the Islamic Eid al-Adha (عيد الأضحى‎), a religious holiday also known as "the festival of sacrifice". By doing his own dangerous stunt work, Cruise very nearly sacrificed himself by spending such a long time clinging to the top of the tallest structure ever created! In the past few weeks, he's also been seen swinging, Spider-man style, from a cable tethered to the building and - as in the photo above - hanging upside down from one of its highest windows. This morning I noticed these big red permanent stickers slapped all over every one of the newspaper/magazine kiosks in front of the Kroger on Linn Station Road. I always wondered if these publications actually asked permission to stick these ugly things all over town, or if they just do it, guerilla-style, and wait for someone to challenge it. There's a handwritten notice on some of the stickers, giving the owners of the respective doohickeys to come and get them in one week or they'll be thrown away. Anyone want some lovely and attractive free paper kiosks, suitable for decorating your apartment in delightful "decline of western civilization" style? I find these accursed things to be almost as much an eyesore and a blight as plastic signs, so I certainly won't shed a tear to see 'em go. What I don't get is why they used stickers that were obviously originally intended to be slapped on an illegally-parked vehicle (threatening the newspaper boxes to be "ticketed or towed" is laughably surreal) and why the number to call for more information has a 513 (Ohio) area code. On a recent visit to Louisville's troubled Eastern Cemetery, I noticed a grave I'd somehow always overlooked in my taphophilic expeditions - that of the great champion boxer Rudell Stitch. Stitch started boxing locally in Kentucky in 1956, and by 1959 he was at Madison Square Garden fighting Gaspar "El Indio" Ortega. 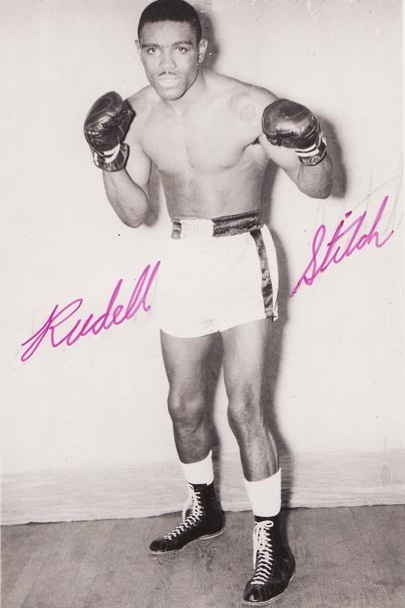 At the time of his death in 1960, Stitch ranked second in the world in Welterweight and was well on his way to becoming champion. Stitch's heroism outside the ring earned him accolades as well, and ultimately led to his demise. In 1959, he saved a man from drowning in the accursed Ohio River, an act for which he was awarded the Carnegie Hero Fund medal of honor. On June 5, 1960, Stitch went fishing with Bud Bruner, Bruner's son, and Charles Oliver, a friend. They were fishing on a rock shelf below the McAlpine Locks and Dam when Oliver slipped. He grabbed Stitch, and they both went into the Ohio River. As he was swimming back to shore, Stitch heard Oliver yelling and went back to get him. Stitch and Oliver, both weighed downed by heavy waders and coats, disappeared in the turbulent water. Their bodies were found by the Coast Guard hours later. For his tremendous sacrifice, Stitch posthumously received another medal from the Carnegie Hero Fund. Only three other people have received two Carnegie Hero Fund medals. Given Stitch's importance, I'm surprised he was laid to rest in Eastern Cemetery rather than Cave Hill. It was, as we now know, an unfortunate choice. In 1989 came the sickening revelation that Eastern Cemetery officials had been secretly burying multiple people in the same grave since the 1920s, and that many people's remains were never even interred. What happened to their remains? No one knows. Stitch's wife, Rosa Mae Huguely, died in 1964 but for some reason her death inscription remains blank. I don't know whether she end up being buried somewhere else, or whether she's here and nobody ever got around to noting it properly on the stone? I hereby make a motion that Stitch's body - if, in fact, the Hannibal Lecters that ran this cemetery did indeed bury him as they were supposed to - be moved to another cemetery. One with the prestige befitting a Kentucky hero of his stature, and one with even a modicum of security. I hadn't been in Eastern Cemetery lately and decided to drop in there this past weekend, to check on its latest state of decay. I am pleased to report that the volunteer preservationists have been doing some good works - many gravestones that have been toppled and laid face down in the mud for years have been hoisted back up and remounted onto the bases of the markers. Unfortunately, the ongoing vandalism seems to be getting worse. For all the remounted stones I saw, I also witnessed many more knocked over that hadn't been so the last time I was here. And then I saw this grave. Someone took an astonishing amount of effort to eradicate the person's name from it. Manufacturers of gravestones engrave the lettering very deep, so you really, really, really have to want to remove a name in order to get it done, and you probably have to spend hours working at it. So the question before us is, why would someone go to so much trouble to obliterate this person's name? And not only the name, but the dates of birth and death. My first thought was that some idiot kids did this, but you know and I know that kids of today probably don't have the attention span necessary to devote so much time and elbow-grease to any task, not even one of evil mischief and of their own desire. No, I hate to say it, but I feel like somebody really hated somebody here, enough to desecrate their final resting place - and in so doing, perhaps remove the last trace of evidence that this person even existed. Well, they failed. They left untouched the text on the reverse side of the tombstone, which is for one Joseph Richardson 1901-1974. So once we know that Richardson is the surname for our mystery person, it becomes clear when we look at her side again. And from there, after close scrutiny, I'm certain the name is "Mary". Someone out there has to know who these people were. Anyone? What is it with deer? They're stalking me. Everywhere I go nowadays, I encounter deer, even in the city. I never used to see them so often, not even when I lived in the wilderness of Waco, KY - with the sole exception of the now-infamous "Devil Deer" incident. But now I see them everywhere (to quote Hank Thompson) and they're popping up in urban settings with greater frequency as mankind continues to encroach on what dwindling wild space is left to them. One even barged into the Middletown Fresh Market a few months ago. And last fall (holy moley - I just checked and it was exactly a year ago today and I didn't even realize it when I started writing this. Now that's weird!) I was driving Westbound on I-64 at night through Franklin County, and ran over an enormous deer. I didn't run into it, I ran over it. Now, the impact was great, to be sure, but aside from a really skull-joggling staccato double-WHAM!! as each set of tires bounced over the unfortunate buck, it was relatively untraumatic. I have pretty darn good reflexes, or so I like to flatter myself, and managed to keep the car straight and continue driving with relative calm. It wasn't until I got home that it really started sinking on me how incredible the whole thing was. It's like in Pulp Fiction where John Travolta and Samuel L. Jackson look at the bulletholes in the wall behind them and can't figure out why they aren't dead. I kept picturing - and still picture to this day - the frozen-in-time snapshot my mind took of the moment just before impact. The deer's considerable rack should have been run over by my driver-side tires, and it's a minor miracle that my tires weren't punctured by them. But then it's a major miracle that I'm even alive at all. When I tell the story to people, many have been incredulous - "you ran over a deer in a Volvo station wagon and didn't wreck? Is that even possible?" I admit it doesn't sound possible at all, and yet it happened. And all I lost was a muffler. I recently saw a news story where a Brownsville man driving one of those monster-sized heavy-duty pickup trucks collided with a deer in Grayson County. If any vehicle could squash a deer, you would expect it would be one of those, right? Nope. The impact sent him flipping over repeatedly, totalling his vehicle. And just this past weekend, someone died in a deer collision in Harold, KY (Floyd County). The statistics for deer/vehicle impact fatalities are so grim that a number of organizations exist to monitor the problem, such as Deer Crash. Anyway, I said all that to say all this: I was in Louisville's Calvary Cemetery the other day, and came face to face with Bambi. We stared each other down for a couple minutes before the little doe decided she didn't want her picture taken. 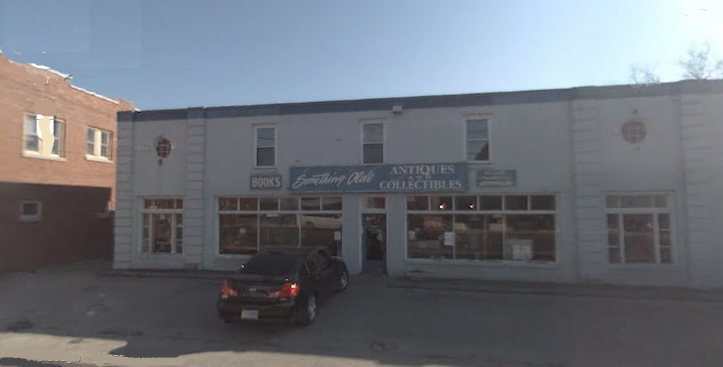 Years ago, during my Lovejoy-esque period as a roving rogue antique dealer, I had booths in flea market/antique mall booths all across central Kentucky, from Mt.Vernon to Lexington to Irvine. And when you're dealing with such a quantity of raw materials from the physical world, soaked with all the history and psychic emotional residue that ends up attached to these items (if you believe in such things), it could drive a man insane. And, some might say, it did the same to me. If you believe that objects could have a will of their own and that they can express displeasure about being someplace they don't want to be, imagine surrounding yourself with antiques - much of which originally entered the market because their former owner died - and you can end up getting bad vibes all over yourself like baby powder or craft glitter. Those were some strange times indeed, and they could provide fodder for countless ghost-story books - no doubt, sooner or later, I will write them. All in time. But one particular incident that comes to mind was a ghost, poltergeist, entity, manifestation, what-have-you, that haunted the Something Olde Antique Mall on Chestnut Street in Berea. I haven't been by there in a long time, but as far as I know, the mall is still there and the ghost probably is too. The building itself was converted from an old Western Auto store from the 50s, but who knows what was on the site prior to that. The upstairs of the place was entirely devoted to old books, with an elaborate array of shelves built to accomodate them. Soon after I moved into the place as a dealer, I learned that everyone there was quite spooked by the goings-on above our heads. Even when nobody was upstairs, you could often hear footsteps walking across the floor directly above our heads. Now, there's no way to convey this via text, but you'll just have to take my word for it that I know the sounds that old creaky buildings can make, and that these sounds were not typical of those red-herring noises of settling foundation, expanding/contracting floorboards, or rattling ductwork. No, these were clear footsteps no different from the ones made when a real person was up there walking - you could even discern that the steps were consistent with a man of some weight, wearing shoes with hard clompy-sounding soles. "See? There it is again!" someone would shout, and we'd all go running up there immediately. And of course, there was nothing. Those who stayed downstairs would invariably report that the footsteps stopped while we were on our way up. It was, truly, one of the weirdest things I've ever seen - or, rather, didn't see. Strange things began to occur after the bookstore opened. People reported hearing the sounds of footsteps overhead when the upstairs rooms were presumably empty. And one piece of furniture back in a dark corner of the store is consistently found out of place when Todd opens the building in the morning. Since the light switch for the second floor is in that corner, Todd says she makes a point of always putting the chair aside when she closes the store at night - a precaution to insure she has a clear path to the switch. One morning, however, she tripped over the chair, which during the night appeared to have been pulled into the middle of the floor, as if someone moved it to sit down for a good read. "I knew I moved that chair the night before because I always walk out that way," Todd says. I've always had a steadfast rule against including things from Indiana on this blog, not because I don't love Indiana (I most certainly do!) but because once you open the floodgates to including stuff near Kentucky, entropy creeps in. Then again, entropy is inevitable, as with all things in the Universe. At least this house is directly viewable from Kentucky, at Carrie Gaulbert Cox Park on the Louisville side of the river. I've heard rumors that the playwright Neil Simon once owned it and used it as an occasional retreat, but have been unable to confirm this. Anyone? It's a beautiful old Victorian house nonetheless. Saw this sign in Ri Ra the other day. I was afraid to inquire to the server for fear that she'd slap me. The news media is buzzing like flies today, over the sentencing of the criminals who allegedly assaulted a Lawrenceburg man. According to reports, the man faced gunpoint and knifepoint as the assailants cut his beard off and forced him to eat it. Apparently, reporter Cathal Kelly of the Toronto Star thinks it's something to make mirth of, with puns like "his hunger for justice". And oddly, though Kelly used this WLEX story as its source, the quotes were altered to reverse WLEX's editorial cleanup of the man's grammar. 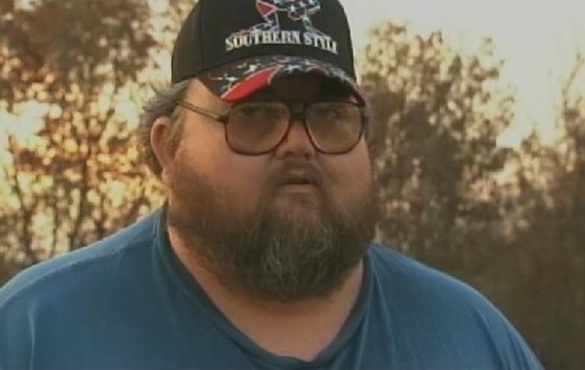 WLWT couldn't help punning either, although they were slightly more subtle: "A central Kentucky man said he's waiting for justice to be served after two men shaved his beard, then made him eat it." The idea of beard-eating is intrinsically humorous, of course, there's no denying it - there's an old Johnny Ryan comic strip that comes to mind - but correct me if I'm way out of line here, assault and violence isn't funny, even if the victim is wearing a Confederate Flag hat. I'm sick to death of media/internet snarkiness that reflexively, as a rule, now feels mandated and obligated to use people's misfortune for bread-and-circuses entertainment. A few years back, I actually saw a "news" story on local TV about an elderly woman who tripped and fell and injured herself, and waited a long time before anyone found her. These capped-teeth talking heads actually peppered the story with puns like "went on a trip this fall" and actually dared to invoke the monumentally unfunny cliche "Help, I've fallen and can't get up". I'm all for making fun of criminals, of course - I mercilessly heckle sociopaths from this microscopic podium in the ocean of internet noise. But I oppose "news" stories that make fun of the victim, an act which places the reporters themselves in the sociopath seat, and encourages the audience to slough their civility and come along for the rude ride. Trimble County again: this monument to war heroes stands outside their courthouse. I've never understood why the Korean War and the Vietnam War sometimes get downgraded to be called a mere "conflict" (and this particular monument avoids putting a label on the Vietnam War altogether). Is it some kind of politically-correct thing? These were wars; call them such. Last month, I briefly addressed the legendary Curse of Constantine Rafinesque, hurled by Transylvania University's notorious eccentric renaissance man. At the time, I had been unable to catch the right people with the keys to his indoor crypt during office hours, but now, I'm happy to present some photos I took of Rafinesque's (alleged) grave in Transy's Old Morrison building. In addition to Rafinesque, St. Saveur Francois Bonfils is also interred here. He was a French language/literature professor at Transy who had previously been an officer in Napoleon's army. He succumbed to the Cholera epidemic in 1849 and was buried in Christ Church Graveyard, then was subsequently dug up and moved to Transy's administration building in 1939 for reasons not entirely clear to me. It's another Kentucky time capsule, this one outside the Trimble County Courthouse in downtown Bedford. I like that they actually don't call it a time capsule, they call it a "birthday vault." One from our abandoned clothing department: why is this single shoe sitting in a cemetery in Trimble County? I mean, really, think about it - what could the story behind this possibly be? Ashland, Kentucky - especially the legendary spirit said to haunt its Paramount Arts Center - is the topic this time in my monthly column Commonwealth Curiosities. Pick up your copy of Kentucky Monthly magazine at reputable newsstands and bookstores everywhere! The area had already been staked out by Matthew Bracken and one Jacob Drennon, but Clark managed to get settlement rights from the state of Virginia (at that time, Kentucky was just a huge county of Virginia, thanks to the illegal Transylvania land grab. In addition to the salt business, Clark also immediately began farming corn there in 1775 and built a huge log fortress which became a popular way-station for fellow travelers. Unfortuately, it was not so popular with the Native Americans, who captured the station, killing two and kidnapping another. This, combined with dwindling salt production there, pretty much spelled the end of the settlement for a time. But then in 1817, the reputation of the curative properties of the area's seven sulphorous springs caught the public's attention, and people began traveling from all over the country to be healed by its waters. Suddenly hotels and hospitals began popping up, and exaggerated rumors of the water's power attracted droves of desperate people, including the terminally ill, invalids and disabled people who believed that the waters would enable them to walk again. In 1849, the fickle finger of fate flicked Drennon Springs once more. The cholera epidemic broke out, and when people learned that even the denizens of the springs were not immune to cholera, its reputation as an all-healing balm went south. Centuries before Clark, however, tribes of ancient mound-building Native Americans dwelled here. According to a newspaper article in 1832, "Drennon's Lick has bones and mounds." What became of those people, and why did they disappear from here? No one knows. By the time Clark showed up and claimed this land in the name of himself, the property was considered by the Shawnee (as well as three other tribes) to be their own, and Clark wasn't invited. Nowadays, compared to the national fame and dangerous days of old, not so much goes on at Drennon Springs - but there's the great Smith Berry Vineyard and Winery nearby, and every year the Historic Drennon Springs Festival is held, with storytelling, arts and crafts, historical reenactments and costumes, horseback riding, and bluegrass music. The Disciples of Christ have had their Drennon Christian Church here for many years, and it also has a long and interesting history. You can see old photos on their site here.